As the title say this is not really about Disney comics, but it’s all about the work of Carl Barks. I recently got the new book The Unavailable Carl Barks (in color) by Kim Weston, and did a little comparison to earlier books collecting the comics. Published by Editions Enfin in 1979 this book collects all non-Disney comics Carl Barks drew, but not the three Droopy stories he wrote. All stories are black and white facsimile copies from the original comic prints. In 2010 Egmont published a book collecting Barks’ non-Disney comics in Norway and Sweden as part of a companion series to Egmont's Carl Barks collection. The book collects all stories except the Andy Panda one. Unlike the previous collection that uses facsimile copies, this book is using high quality black and white proofs with new coloring. The exception is one of the Droopy stories (the 1953 one) and the Porky Pig story where no high quality sources seems to exist. The Droopy story is a facsimile copy in this book too, while an attempt to clean up the black lines has been done to the Porky Pig story. In addition to the comic stories the Egmont book has a couple of great articles by Geoffrey Blum and Ulf Granberg. Unfortunaly this book is only translated to Norwegian and Swedish, it would have been great to have the same book with the original English dialogue too! The Carl Barks Big Book of "Barney Bear"
Published by IDW under the YOE Books imprint in 2011, this book collects all 26 Barney Bear and Benny Burro stories. But does not include the three single Benny stories, or any other non-Disney stories by Carl Barks. But we do have some great articles in the beginning with photos and artwork. 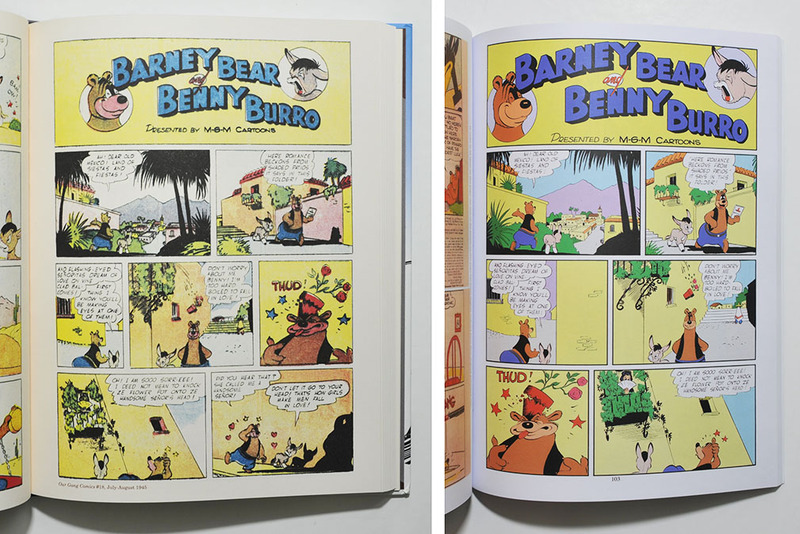 Like the Barks Bear Book, all stories in this book are also facsimile copies from the original comics, but this time in color – and in a lot better reproduction quality. Published in July 2016 by Kim Weston using the self-publishing service CreateSpace Independent Publishing Platform. The book is aimed to be a companion book to the Barney Bear book from IDW/YOE Books, publishing the stories that are missing in that book plus some extra stuff. The book even has two Disney-stories. One is a restoration of Kite Weather to a 3-tier layout - the same version published in The Carl Barks Fan Club Pictorial, that I made a blogpost about earlier. The other one is a one-pager from Donald Duck #36, that Kim thinks must have been written by Carl Barks. The book is using a mix of sources, some are facsimile copies with various editing work, some are b/w proofs that are colored, and some are restored to a layout closer to how Barks originally drew the stories. As with Kite Weather, the restoration work on the non-Disney comic stories are done with "educated guesswork", but I'm sure a lot of time and effort is used to reconstruct the layot as cloesely as possible. Exactly how Barks’ original art looked like we’ll probably never know. In-between the comics we also have nerdy (but great!) comments and articles by Kim Weston. At the end of the book there’s also a 10 page cross reference index to "everything" in Barks’ non-Disney comics. Some of the different restorations used in The Unavailable Carl Barks book are previously published in The Carl Barks Fan Club Pictorial. I think most are exactly the same, but the Happy Hound one was not colored in the Fan Club Pictorial. In the picure under you can also see a comparison of the layout used in Our Gang #11 (and the Egmont book) with the 3-tier restoration. Here's another example of a layout restoration. This time the Barney Bear and Benny Burro story from Our Gang #18 restored from 6 pages to 8 pages but still 4-tier per page. Thank you for the review and comparisons of The Unavailable Carl Barks (in color). Proofs were not used for Andy Panda, Porky Pig and one of the Droopy stories because no known proofs exist. But proofs were used for the other non-Disney stories. I didn't previously know that there was also a Norwegian edition of Bruno Bjørn, but those 2 editions didn't use proofs for the Porky Pig, either. A copy of the comic was scanned and the color was removed and then the cleaned scans were re-colored. Compared to the other stories, which were taken from proofs, it suffers badly. But most of the rest of the book looks great. I wish someone had licensed it in the USA, Craig Yoe and IDW, for example, but they didn't. Despite the sloppy printing, bad and out of register color, I think the slightly cleaned up version in the The Unavailable Carl Barks does a better job of revealing Barks' essential line quality in the art than the Egmont version. I might note that Bugs Bunny's nose is missing on page 2 panel 5 of the original comic and the Egmont book. We restored it by cloning it from another Bugs Bunny face in the comic. However, in the Big Little Book version of the story, Bugs' nose is there, presumably as drawn by Carl Buettner, but otherwise, the print quality in the Big Little Book is mostly even worse than in the original comic book. You are right, the Porky Pig story in the Egmont book is not from a high quality source – but an attempt to clean up the black lines has been done and the story is then re-colored. This has been done with varying results; especially page 23 does not look good in the Egmont book. I slightly edited the text about this in my blogpost, thanks for noticing. The Norwegian companion series called "Carl Barks Ekstra" is actually more complete than the Swedish edition as we got a book about the work in Calgary Eye-Opener and a huge index book too. So the Norwegian series is six books while the Swedish one is four books. The last book about the paintings is also translated to German and Finnish. The companion series was printed in limited editions and available as a subscription series, but I don’t think they sold that well. As I write this the Norwegian publisher are still selling the unsold books on their webpage (in Norwegian).